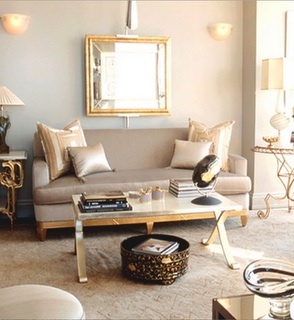 For the most part, jewelry inspired interior design has come in the form of colors, hues and finishes. But more designers are using actual jewelry, jewels and accessories to inspire their interior design ideas. Popular jewelry display ideas include a chandelier that would be gorgeous as earrings and chairs that are reminiscent of a pearl necklace. In this room’s dining room design are a set of gorgeous dining room chairs and a beautiful chandelier, both of which are accented with a soft pastel color palette. 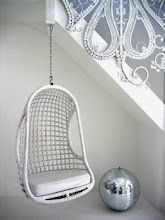 The pearlescent finish on the chairs is gorgeous and the chandelier is pretty enough to wear as earrings. This dining room is also beautiful, having been inspired by Lucite and metallic jewelry. This simplicity of this Italian dining room is accented by a group of glittering chandeliers with cascading crystals. The mother-of-pearl in this wall covering by Maya Romanoff glitters like a beautiful gold necklace. Two champagne-colored silk lamps flanking the bed hang like a pair of expensive earrings. Capiz chandeliers are a great way to bring a little jewelry inspiration into your home. 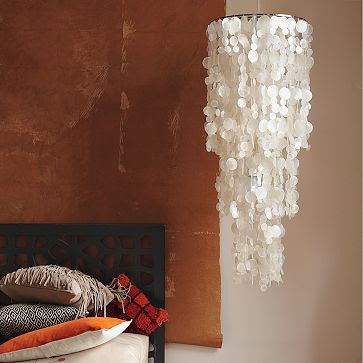 This one hangs like a beautiful necklace with translucent, light-reflecting pieces of capiz shell. More and more designers are incorporating jewelry displays into their designs. This idea was actually inspired by a curtain wall. Take some of your cheaper, costume jewelry and hang them from hooks on a pole attached to a wall. It’s a beautiful and eclectic way to display your jewelry, but unless you’re really tall, save the jewelry you don’t ever wear for a project like this. Here’s an easier way to incorporate jewelry into your bedroom design:  display your everyday baubles in vintage frames. Interiors that incorporate jewelry do so in such creative ways. This post comes courtesy of Design Shuffle, where you can find top tier interior designs from around the world – from New York interior designers, Los Angeles interior designers, and more, check out the latest at Design Shuffle.